The HAO Bass Liner was co-designed by Phil Jones of Phil Jones Bass. Daring Audio announces a new High Definition (HD) model to broaden its product line, starting with the Edge Activator HD. Today, I won't be gentle: kill the Care Bears, throw the wooden cross of the "Little Singers of Paris" into the fire and make place for the distortion god. 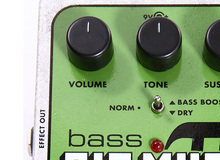 The Markbass MB Octaver is an analog octave pedal with separate control for the dry signal, octave down and two octaves down.